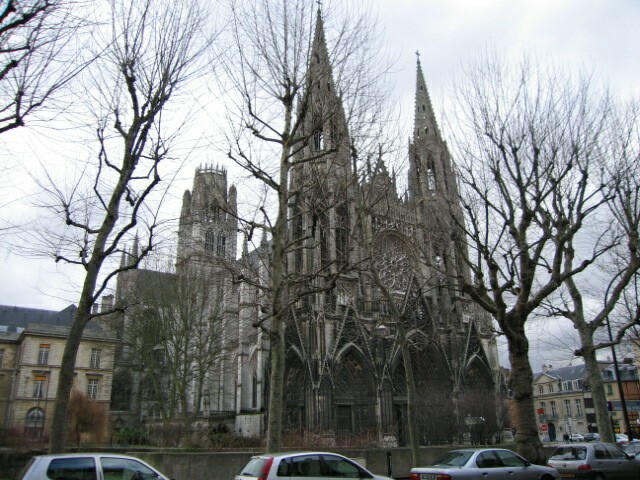 February 19-20, 2005 - We were able to meet up with Court in Rouen, France this weekend. We had a really great time. Since it was the half-term holidays for practically every school kid in Europe this week, we had to be creative with our travel plans. We left our place in Cambridge at 4am on Saturday to catch a train to London. From London (Waterloo!) station, we caught the Eurostar train to Paris, which goes via the Chunnel. We then caught a train from Paris to Rouen. We reversed this track on the way hom to Cambridge and just barely (think: running up the escalators in the London underground) made the last train back to Cambridge. We finally got home around 2am. It was another long travel weekend (though our first in some time) but well worth it. 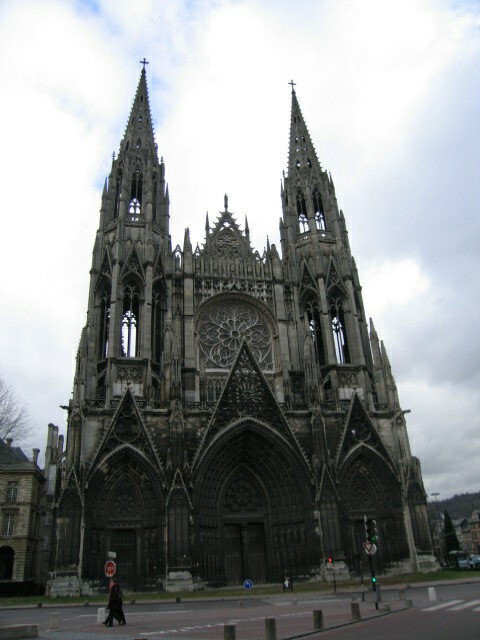 Rouen is the capital of Normandy. It was founded by a viking, Rollo, who now rests in the Cathedral. 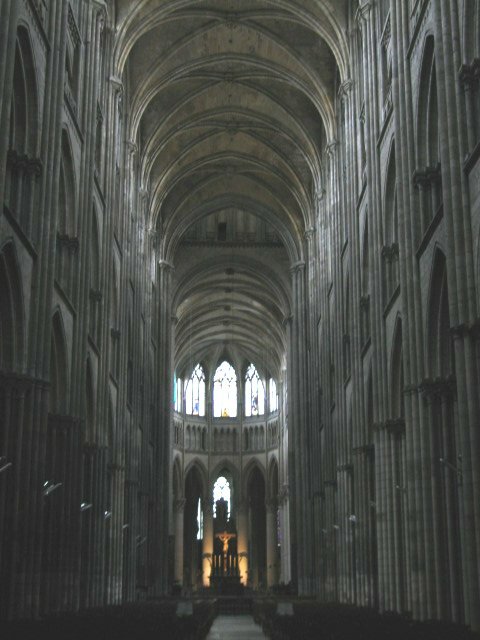 The Cathedral also claims to hold the heart of Richard the Lionheart (because he was so fond of Rouen - the Plantagenets were Normans themselves), his brother Henry the younger, who failed in rebellion against his father Henry II, and Mathilda, mother of Henry II. 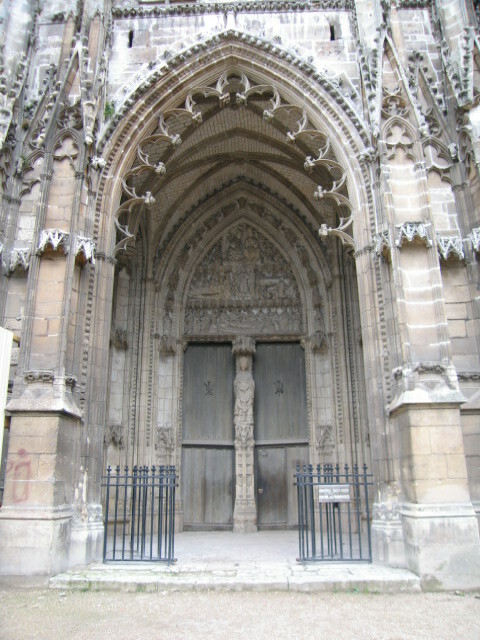 Joan of Arc was tried and put to death in Rouen. 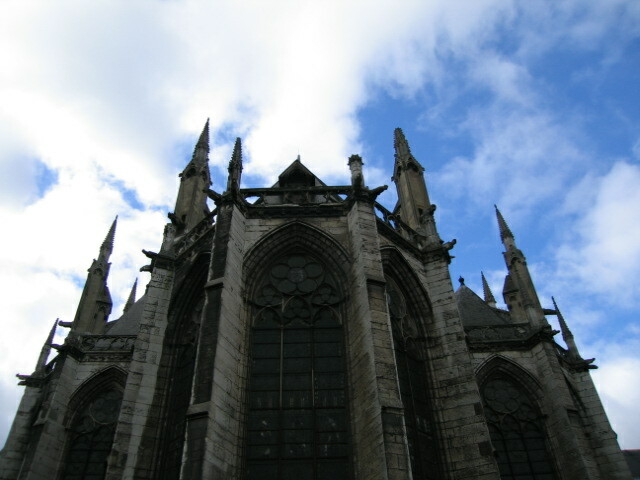 It is typical of Rouen that I had to rotate probably ninety percent of my photos before I could post them on the web. 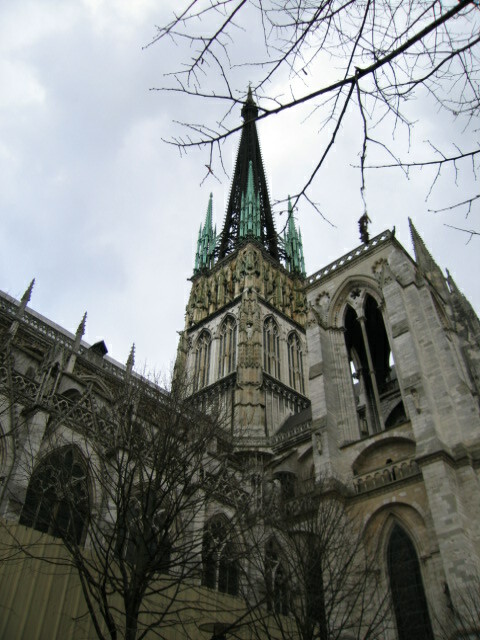 The great churches of Rouen are built in the tall, soaring Norman Gothic style. It was difficult to capture many of the churches on camera. 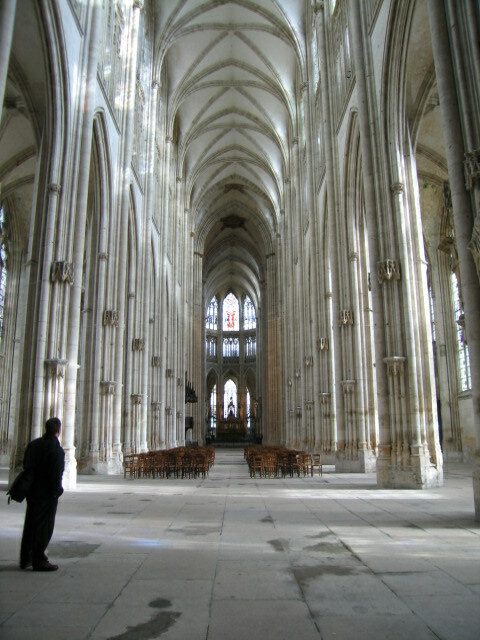 Rouen was badly damaged in WWII and many of the churches were not fully restored until near the end of the twentieth century. In some places,it is possible to see bits of metal that were fused into the stone of the churches when they were hit by bombs. Rouen has spent much money and done an excellent job with the restorations. 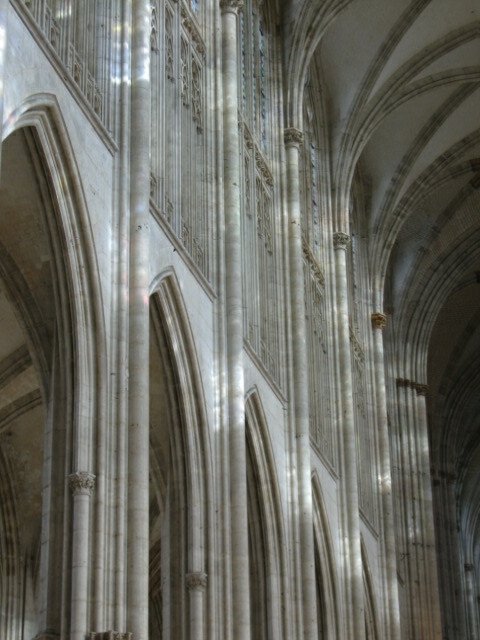 Some of the stained glass windows were too badly damaged to be repaired and these have been replaced with colorless glass. 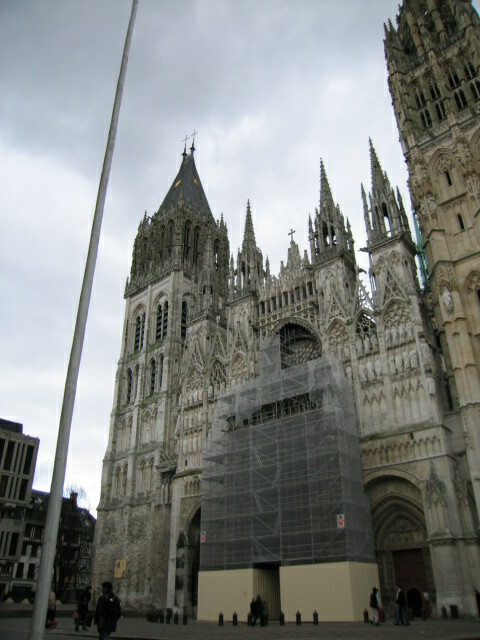 Rouen's famous cathedral was painted many times by Monet. (He did a slightly better job of capturing the facade... and didn't have flagpole in his picture... click here to see his paintings of the cathedral.) Sunday morning we were able to attend mass in the cathedral. It was impressive and really, really cold. The only heat was from heat lamps (which seem to be a big thing in France... I felt a bit like fast food) hanging from the ceiling. Everyone stayed bundled up in coats, scarves, and gloves and you could see your breath. Imagine what it was like before polar fleece! 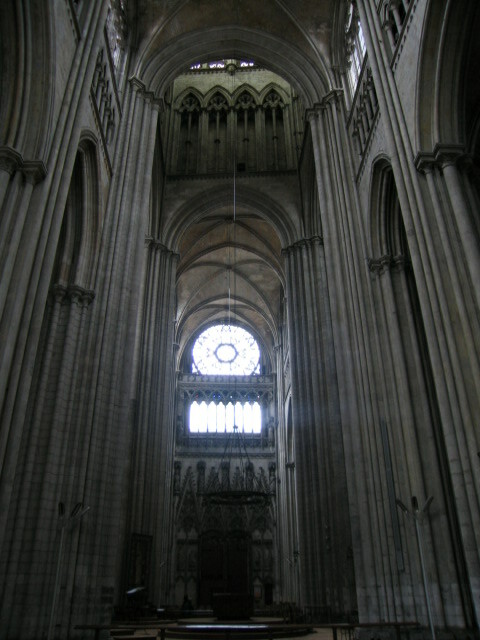 These pictures are also of the interior of the Cathedral in Rouen. 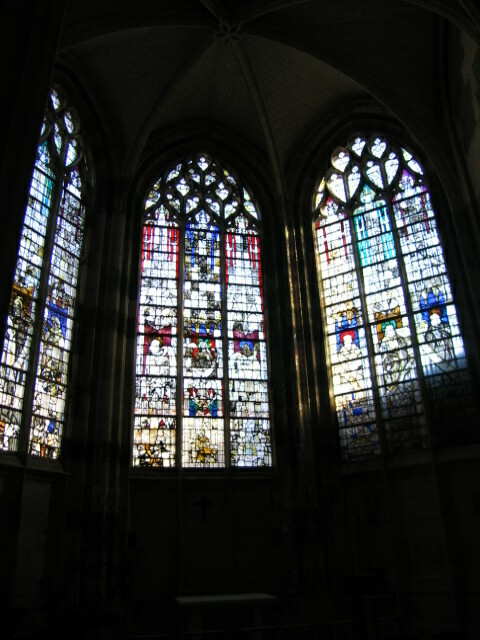 This bright stained glass window (second picture) illustrates the legend of St Julian and was one of the inspirations for the story of St Julian in Flaubert's Three Tales. 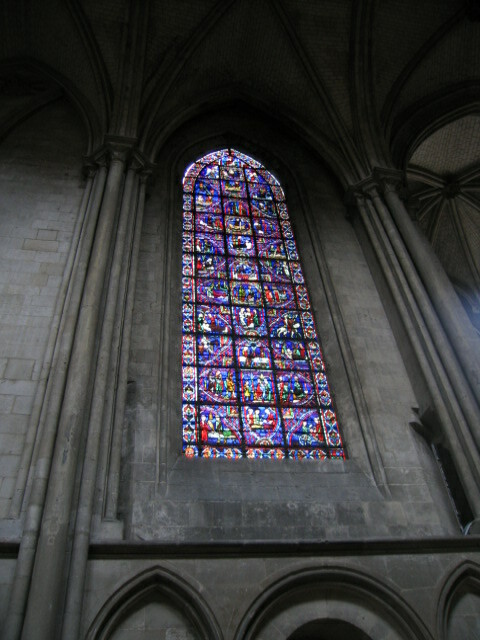 The rose window (third picture) is an example of a window damaged in WWII and replaced with clear glass. 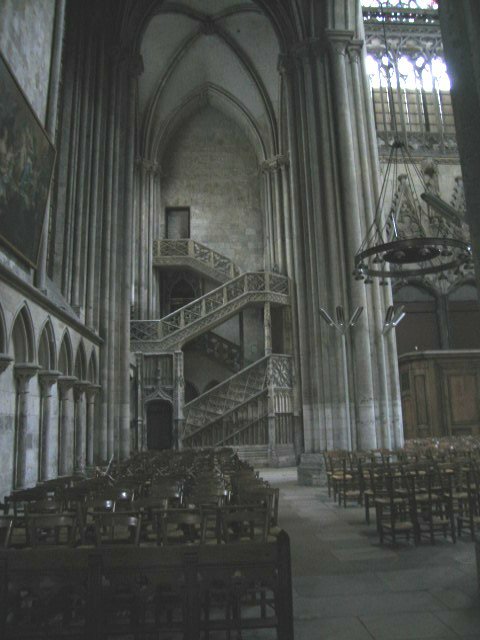 The impressive staircase (fourth picture) once led to the monastery attached to the cathedral, now destroyed. This is the church of St Maclou (a Welsh missionary to Normandy, aslo known as St Malo... perhaps from the clan Maclou?). Near the church of St Maclou is the aitre St Maclou (third picture). 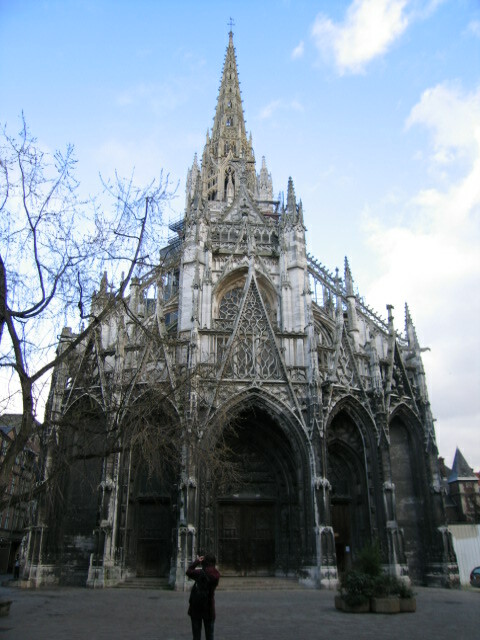 This structure was used as a charnel house (mortuary chapel and burial place) during the plague years in Rouen. 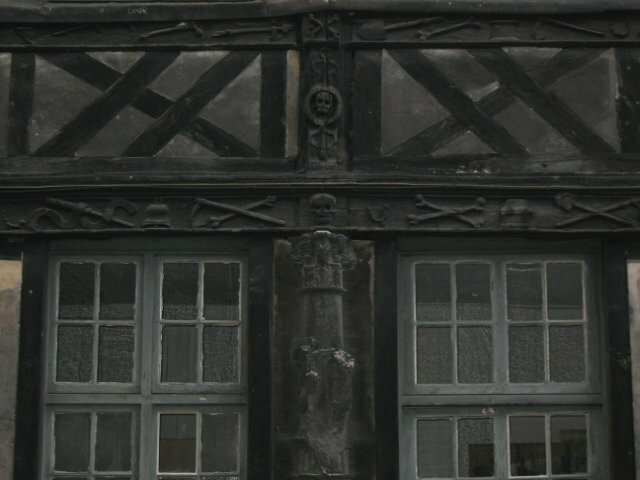 Hence the 'dance of death' motif carved into the lower story of the building. 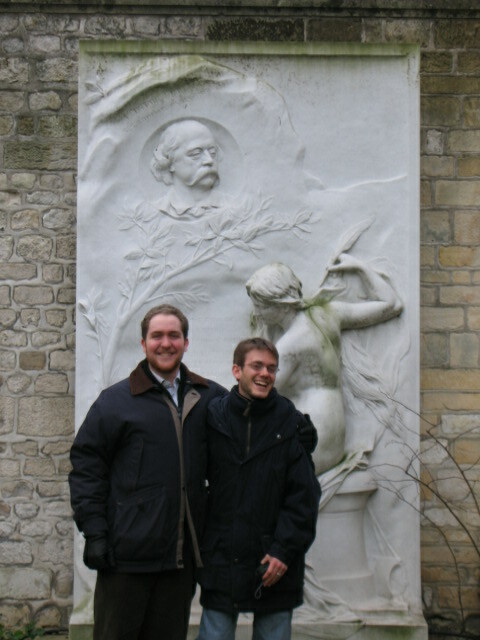 Here Paul and Court share a laugh in front of the Gustave Flaubert memorial at the Museum of Flaubert and the history of Medicine. 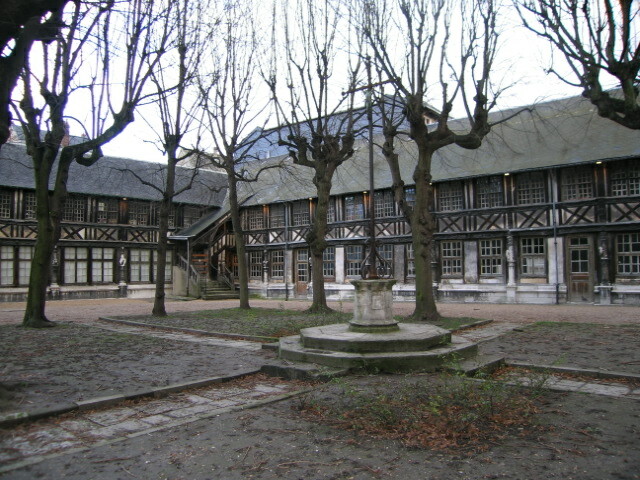 Flaubert's father was the director of the hospital in Rouen and Gustave was born there in 1821. The hospital is now a museum. The room where he was borned is kept with period furniture and momentos and the rest of the museum is filled with a strange collection of mummies, stuffed parrots, apothecary jars, and anatomical models from the nineteenth century. Interesting. 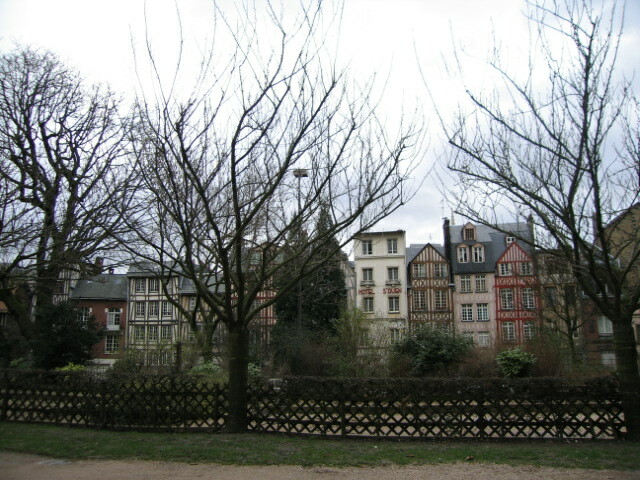 Although Rouen was badly damaged in WWII, it has been reconstructed and the center of town has been given a period feel, complete with half-timbered houses (second picture). We next visited the church of St Ouen. This church was built over a period of several hundred years and was connected to an abbey that was never completely finished. 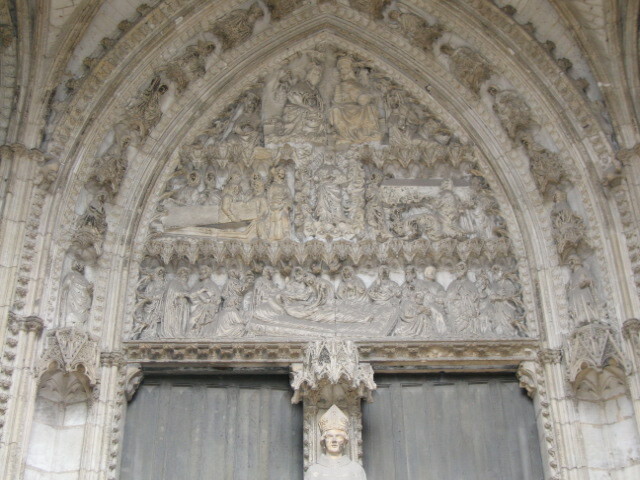 The first two picture are of the side door into St Ouen and its impressive carvings. In the third picture you can even see blue sky. The sun appeared and disappeared during the day, but I managed to capture the colors of the light coming through stained glass in the interior (fourth picture and first picture of next series). 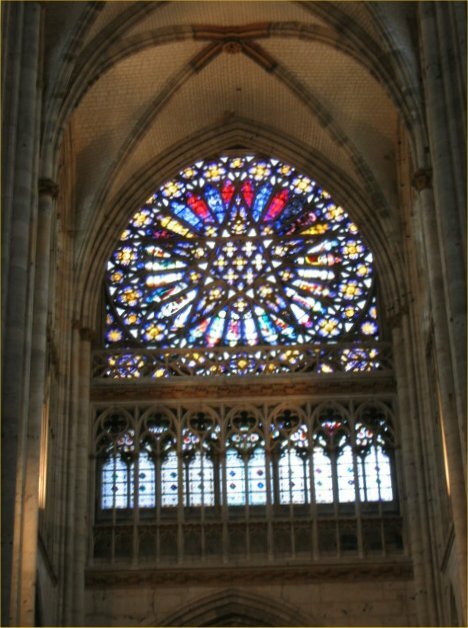 This rose window (second picture) at St Ouen has much of its original color. 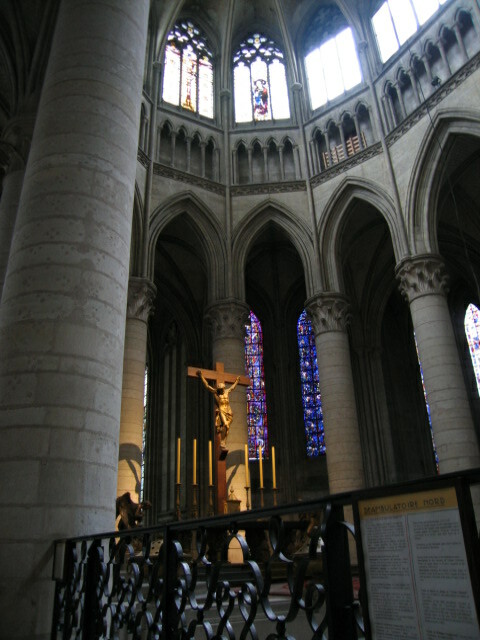 The final picture is of the so-called tower of Joan of Arc. 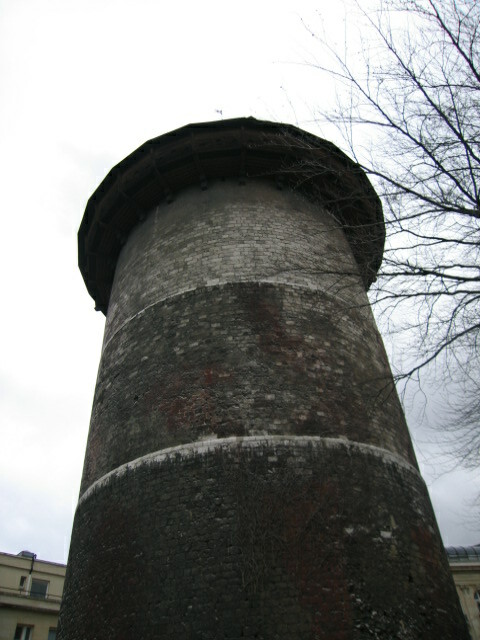 This tower was a part of the fortress of Philip (II) Augustus, king of France in the thirteenth century. 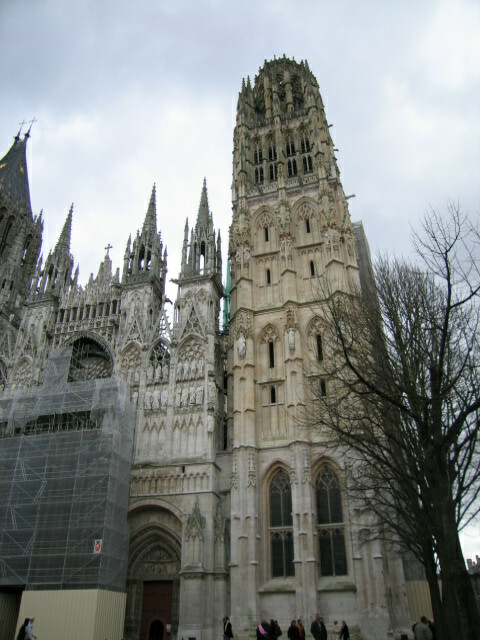 Joan was held here briefly and the preserved tower is now a mini-museum of Rouen and the fortress.